This Tuesday, and following the testimony of Felipe Martínez Rico, number two of Cristóbal Montoro in the Ministry of Finance, Civil Guard agents who participated in the searches of 20 September began their declarations. The first to be questioned as a witness was one of the agents who arrested Lluís Salvadó, then Secretary of the Treasury of the Generalitat. He registered his home and his office. "If this is going to be the tone set in relation to the agents that will declare, this defence counsel understands that it could directly affect the presumption of innocence, as the image of agents is tried to be hidden." "Since we had Mr. Salvadó's telephone tapped, we later checked that call, in which one of the secretaries, who later identified herself as Elisabeth Terrades, if my memory serves me correctly, said to Mr. Salvadó:" The Guardia Civil has come " Then he says: "Enter the office, take the stack of papers on top of the meeting table and throw them into the yard." According to the witness, the secretary already had the Guardia Civil agents in her office, so she told him she didn't have time to do it. "War scenario" and "guerrilla scenario"
"Among the documents that were found, we were struck by one that was inside a blue folder on the desk in his office, consisting of two manuscript sheets with the titles "scenario of war" and "guerrilla scenario". Its content included legal and financial measures that the Spanish State could take against the independence challenge, and the means of subsistence that Catalonia could take against them." "We found some torn pages inside the photocopier room, in a wastebasket. We proceeded to rebuild them. There were 8 pages in which one could read: "Scenarios after the referendum" with a division into 4 phases; It was on the electoral night after the referendum, the recount and formal proclamation accompanied by symbolic acts, legal transitoriness and a transitional constituent process." 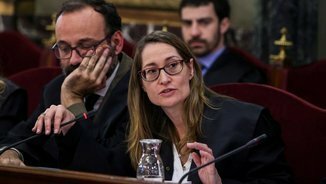 Agent H11346M explained that when they were finishing the searches, Oriol Junqueras arrived accompanied by about 10 people, and that, despite being told he could not get close to Salvadó, the then Deputy Prime Minister hugged him and kept with him "a brief conversation in Catalan, seems to be". Agent H11346M: "They shouted: "we will vote","independence"," occupation forces go away","fascists","coup plotters","terrorists"." Javier Zaragoza: "When leaving after the searches at the Ministry of Finance, did the people gathered there block your way out, did some anomalous situation occur?" Agent H11346M: "I don't think so." Javier Zaragoza: "Did you not feel that your work had been hampered?" 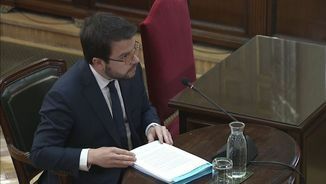 Agent H11346M explained to the State Prosecutor's Office that one of the tasks he undertook during the investigation was a "photographic report" on the concentration before the Department of Economy on 20 September, based on the broadcast offered by TV3, Antena3 and Tele5. 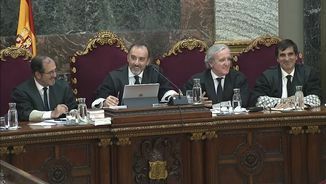 Jordi Sànchez's defence counsel, Jordi Pina, asked him over the criteria followed to make this report, which consisted of screenshots of specific moments of the broadcasts. Agent H11346M: "Screenshots of the most significant images were taken. All videos were not been incorporated due to their magnitude, but they are available by order of the court ". Jordi Pina: "In reference to this sentence you just stated, "The most significant images"
when you say so, what do you exactly mean? Most significant, in which sense?" Agent H11346M: "The most significant of what took place on September 20 at the headquarters of the Ministry, at the Ministry of Foreign Affairs and the Ministry of Finance." Jordi Pina: "By which personal criteria did you not consider these other images to be of interest?" Agent H11346M: "The most significant images were not those of a concert. A siege was taking place on the headquarters of the Ministry." Van den Eynde: "You worked under the orders of the lieutenant colonel, I think his name is Mr. Baena, is that so"? Agent H11346M: "The investigator of the proceedings is the lieutenant colonel chief of the judicial police of the seventh zone in Catalonia." Van den Eynde: "Is his name Baena?" 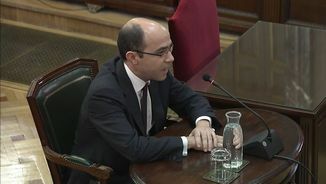 Agent H11346M: "I have told you that he is the lieutenant colonel of the judicial unit of the seventh zone in Catalonia. You should have enough with what I already said." Manuel Marchena: "Do you know the name, and wether it matches with the last name you just identified?" Agent H11346M: "I just don't know if I have to answer. I identify myself with my agent ID number, and so does my partner." 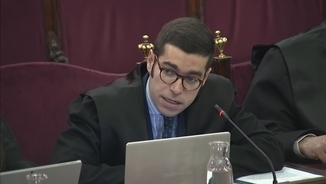 Manuel Marchena: "But Mr. Baena, who is someone who has already been in this trial, did not request any mechanism to exclude his identification to be public, nor is his privacy or protection being affected, therefore... "
Van den Eynde: "It is just OK if we refer to him by his agent ID number."